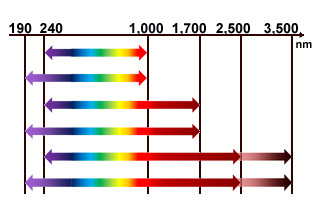 The SENresearch 4.0 spectroscopic ellipsometer covers the widest spectral range from 190 nm (deep UV) to 3,500 nm (NIR). High spectral resolution is offered to analyse even thick films up to 200 µm thickness using FTIR ellipsometry. There are no moving optical parts during data acquisition for best measurement results. The Step Scan Analyzer (SSA) principle is a unique feature of the SENresearch 4.0 spectroscopic ellipsometer. The extension of the SSA principle by the innovative 2C design allows measuring the full Mueller matrix. The 2C design is a field upgradable and cost-effective accessory. The SpectraRay/4 is the full-featured software package for advanced material analysis. SpectraRay/4 comprises the Interactive Mode for research with guided graphical user interface and the Recipe Mode for routine applications. SENresearch 4.0 spectral ranges, options Options: Manual goniometer Motorized Pyramid Goniometer In situ, in line, and desktop Reflectometer and field upgradable accessories Accessories: Mapping Turntable for anisotropic samples 2C for full Mueller matrix measurement Video based auto-align Microspots Liquid cells Heating and cooling stage Transmission holder . SENresearch 4.0 uses fast FTIR ellipsometry for the NIR up to 2,500 nm or 3,500 nm, respectively. It provides broadest spectral range with best S/N ratio and highest, selectable spectral resolution. Silicon films up to 200 µm thickness can be measured. The measurement speed of FTIR ellipsometry compares to diode array configurations, which are also selectable up to 1,700 nm. The new motorized Pyramid Goniometer features an angle range from 20 deg to 100 deg. Optical encoders ensure highest precision and long term stability of angle settings. The spectroscopic ellipsometer arms can be moved independently for scatterometry and angle resolved transmission measurements. SENresearch 4.0 operates on the Step Scan Analyser (SSA) principle. The SSA decouples the intensity measurement from mechanical movement, thereby allowing to analyse even rough samples. All optical parts are at rest during data acquisition. Furthermore, the SENresearch 4.0 includes a fast measurement mode for mapping and in situ applications. SpectraRay/4 is the comprehensive spectroscopic ellipsometer software for the SENresearch 4.0. It comprises two modes of operation: The Recipe Mode and the Interactive Mode. The Recipe Mode allows for easy execution of routine applications. The Interactive Mode guides through the ellipsometric measurement by an interactive graphical user interface. Tools: Ellipsometry Transmission Reflection Multiple angle of incidence Multiple sample Combined photometric measurements Depolarization Full Mueller matrix Generalized ellipsometry Scatterometry for spectroscopic ellipsometer measurements and analysis. Documents To get more information, please click here.